history – King James Only? Edward F. Hills is best known for his 1956 book The King James Version Defended: A Christian View of the New Testament Manuscripts (Christian Research Press). Assessments of Hills’ legacy are offered by both King James Only advocates (here and here), and critics (here). All agree that Hills was unique in being the only defender of the King James that had studied in the field of textual criticism, a ThD from Harvard, no less. It was actually by reading Hills’ work, that I first began to doubt the tenets of King James onlyism, since he is honest with the evidence and admits to a few errors in the Textus Receptus. Hills also espouses a more Calvinistic bent in his theology than I had been exposed to up to that time, but what most made me pause in my reading of Hills, was his unabashed acceptance of geocentrism. He is not the only King James proponent to hold to geocentrism (the idea that the sun and planets rotate around the earth), see this article by Dr. Thomas Strouse. With this wariness in my mind, I was intriguted when I found a copy of another smaller title written by Edward Hills: Space Age Science (Christian Research Press, 1964). In this title it appears he backs off of his geocentric views, somewhat – but later editions of his more well known work do not clarify matters. Here is a brief review of this book, which I recently read with interest, particularly in light of the modern debates over science and the Bible. This book displays an interesting perspective on science and faith, from the early 1960s. Hills does a good job explaining Einstein’s theories, but his critiques and biblical application don’t stand on much. He doesn’t cite authorities backing up his claims. “When we consider what the Scriptures say concerning the movements of the heavenly bodies, we see that they by no means teach the Ptolemaic theory” (p. 55). He goes on to quote Ps. 19:6 as showing the sun moves on its circuit. And points out the context of Ps. 93:1 a verse taken to prove geocentrism. He points out that God “hangeth the earth upon nothing” (Job 26:7) and says “The astronomy of the Bible is not earth-centered but God-centered” (p. 55). After doing some searching, I did find that this contradicts what Hills states in his book The King James Version Defended. There (in the 4th edition, 1984, pg. 7) he states that he thinks it likely that Tycho Brahe’s theory (the predecessor of Copernicus) that the earth rotates on its axis and the sun and planets rotate around the earth is “probably correct.” It appears his conclusions in this volume (Space Age Science) are tentative and underplayed. Another intriguing element of this book was his concession that God’s initial creation may have been just “mere energy out of which matter was later constituted” (p. 71). But then he disavows the deep time involved in modern astrophysics: “No billion years were required for the light of even the farthest star to reach our earth’s atmosphere, for God’s almighty power was able to bring it there in an instant of time” (p. 73). He even suggests that this may be what is intimated by the fact that God “set” the great lights in the firmament (p. 73). Overall this is a fascinating insight into a Christian scholar trying to grapple with modern science from a believing point of view. I don’t think his qualifications from a scientific background fit him well for writing this book, and I don’t follow him in all his positions; but his attempt to apply the Bible and asses modern scientific developments is laudable. Pick up a copy of this book at any of the following online retailers: Amazon.com, Bible Baptist Bookstore. 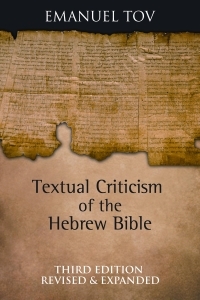 Reading Textual Criticism of the Hebrew Bible by Emanuel Tov was both a joy and a challenge. I thoroughly enjoyed immersing myself in the world of the Hebrew Bible. Ancient manuscripts, Dead Sea Scroll finds, ancient versions, textual variants — all of these things stir the Bible-geek in me. At the same time, the state of current scholarship with regard to the Old Testament text can be a bit troubling to an evangelical Christian. While the New Testament stands affirmed by numerous manuscript discoveries to the extent that almost all textual critics can agree on the vast majority of the minute details of the text, the same cannot be said for the Hebrew Old Testament. Emanuel Tov takes readers of all scholastic levels by the hand as he surveys the field of Old Testament textual criticism. This third edition of his classic textbook, explains things for the novice and scholar alike. Careful footnotes and innumerable bibliographic entries will impress the scholar, while charts, graphs and numerous glossaries keep the would-be scholar feeling like he is getting somewhere. I have no problem admitting that I am one of the would-be scholars, with barely a year of Hebrew under my belt. Yet I was able to work my way through this book, becoming sharper in my Hebrew and awakening to the many facets of the intriguing study of OT textual criticism. Tov has departed from a more traditional stance in his earlier versions, opting instead to follow the evidence from the Dead Sea Scrolls and contemporary studies. He manages to keep away from a fatal skepticism, however, arguing that textual evaluation still has merit. The aim is still to recover the earliest possible text, but the recognition that there are often two or three competing literary editions of the text complicate the matter. An example would be the different editions of Jeremiah, with the Septuagint (LXX) Greek version differing drastically from the Hebrew Masoretic Text (MT). 1 Samuel provides another example with a Dead Sea Scroll offering perhaps a third different competing literary edition. Tov points out the two very different versions of the story of David and Goliath and Hannah’s prayer as he expounds on the problem. Tov’s textbook goes into glorious detail concerning all the orthographic features that make up paleo-Hebraic script, and the square Hebrew script we are familiar with. His knowledge is encyclopedic, to say the least. The numerous images of manuscripts that are included in the back of the book are invaluable. His discussion on the orthographic details of the text should convince even the most diehard traditionalists, that the vowel points and many of the accents were later additions to the text, inserted by the Masoretes. Some still defend the inspiration of the vowel points, but Tov’s explanation of numerous textual variants that flow from both a lack of vowel points and from the originality of paleo-Hebraic script (and the long development of the language and gradual changes in the alphabet, and etc.) close the door against such stick-in-the-mud thinking. Tov’s book details the pros and cons of different Hebrew texts, as well as discussing electronic resources and new developments in the study of textual criticism. His work is immensely valuable to anyone interested in learning about textual criticism, and of course is required for any textual scholars seeking to do work in this field. Tov doesn’t add a theology to his textual manual, however. And this is what is needed to navigate OT textual criticism. After having read Tov, I’m interested in seeing some of the better evangelical treatments of the textual problems of the Hebrew Bible. I believe we have nothing to fear in facing textual problems head on. Seeing different literary editions of the text can fill out our understanding of the underlying theology of the Bible as we have it. Some of the work of John H. Sailhamer illustrates this judicious use of contemporary scholarship concerning the literary strata of the text. Tov’s book is not law, and he sufficiently qualifies his judgments. He stresses that textual criticism, especially for the Old Testament, is inherently subjective. It is an art. And those who don’t recognize that, are especially prone to error in this field. This book equips the student to exercise this art in the best possible way. Tov walks the reader through evaluating competing textual variants, and his study will furnish the careful reader with all the tools to develop their own approach to the text. Tov’s findings won’t erode the foundations of orthodox theology. I contend that they will strengthen it. As with NT textual criticism, paying attention to the textual details has unlooked-for and happy consequences. It strengthens exegesis, and allows for a greater insight into the meaning of the text. And it can build one’s faith. Bible-geeks, aspiring scholars, teachers and students alike will benefit from this book. Understanding the current state of OT textual criticism puts many of the NT textual debates into perspective. Christians don’t know their Old Testaments well enough, and studying the text to this level is rare indeed. I encourage you to consider adding this book to your shelf, and making it a priority to think through the challenges surrounding the text of the Hebrew Bible. Emanuel Tov is J. L. Magnes Professor of Bible at the Hebrew University in Jerusalem and Editor-in-Chief of the Dead Sea Scrolls Publication Project. Among his many publications is The Greek and Hebrew Bible-Collected Essays on the Septuagint (1999). • direct from Fortress Press. Disclaimer: This book was provided by Fortress Press. I was under no obligation to offer a favorable review. This article was originally posted at my personal blog, Fundamentally Reformed. John Chitty, known in the blogosphere as Captain Headknowledge, recently had the opportunity to attend a symposium on the St. Catherine’s monastery library and the significance of the Sinai manuscripts, held at the Center for the Study of New Testament Manuscripts (CSNTM). Chitty has shared the text of Father Justin’s lecture: “St. Catherine’s Monastery: An Ark in the Wilderness”. I encourage you to take a look as the lecture covers the well known and the not so well known about St. Catherine’s Monastery. I’m not sure I had heard that they made some new manuscript discoveries there as late as 1975. The monastery has never been destroyed or abandoned in all its centuries of existence. The climate at Sinai is surprisingly dry and stable, the humidity averaging from twenty to thirty percent. All of this, and the diligent care of the monks, account for the preservation of many manuscripts. The Sinai library is today a remarkable treasure for the antiquity and the significance of its volumes. The library contains 3304 manuscripts, written in eleven languages. These are predominantly Greek, Arabic, Syriac, Georgian, and Slavonic. The manuscripts range in content from copies of the Scriptures, services, and music manuscripts, to sermons, writings of the Fathers, lives of the Saints, and books of inherited spiritual wisdom. The library also includes medical treatises, historical chronicles, and texts in classical Greek, which is the pinnacle of the Greek language. A few of the manuscripts are splendid works of art, with gilded letters and brilliant illuminations, created in Constantinople in the tenth, eleventh, and twelfth centuries, when the City was at its height as the centre of culture and devotion. But no less significant are the humble manuscripts written at Sinai, often on reused parchment, bound between rough boards, the pages stained from long use, a witness to the deprivations and austerity of Sinai, to the generations of monks who have maintained the life of devotion and the cycle of daily services at this holy place. But perhaps we would come to a greater appreciation of the Sinai library if I could describe four manuscripts in particular, all of which have been recently studied by scholars. Saint Catherine’s Monastery is a treasury filled with things new and old. Scholars still have much to learn from its library, its numerous icons, vestments, ecclesiastical vessels, its architecture. In all of this, it is a veritable ark in the wilderness.